Why isn’t an armed Mandalay Bay security supervisor identified in Las Vegas police report? LAS VEGAS — The Las Vegas Metropolitan Police Department’s final criminal investigative report on the October 1 massacre at the Route 91 Harvest music festival fails to identify or even mention an unidentified armed Mandalay Bay Hotel security supervisor who was with two other armed security management personnel and two LVMPD police officers as they retreated on the 31st floor of the hotel while Stephen Paddock fired from his 32nd floor suite. As previously reported by the Baltimore Post-Examiner, that armed group of five failed to take any action to reach the 32nd floor, fully aware that people were being killed and wounded at the concert venue. The LVMPD final report list as key witnesses during the investigation, Mandalay Bay Security Operations Manager, Anthony Sottile, and Assistant Security Managers, Michael Oelke and George Umstott. Anthony Sottile was the subject of several stories published by the Baltimore Post-Examiner as Sottile was the armed manager who told the FBI and the LVMPD in his recorded interview that he was on the 32nd floor of the Mandalay Bay Hotel with LVMPD Officer Cordell Hendrex during the time that Paddock was firing from inside his suite. Sottile was later discredited when the LVMPD released police body-worn camera footage that showed Officer Hendrex was on the 31st floor during the time Paddock was firing and not on the 32nd floor as Sottile stated. When that body-worn camera footage was released it showed Hendrex and his partner, Officer Eliff Varsin on the 31st floor during the time Paddock was firing from his 32nd-floor suite, along with THREE armed Mandalay Bay security supervisors. Two of those supervisors are George Umstott and Michael Oelke, however, the third Mandalay Bay armed supervisor is never identified let alone mentioned in either the LVMPD preliminary or final criminal investigative reports. 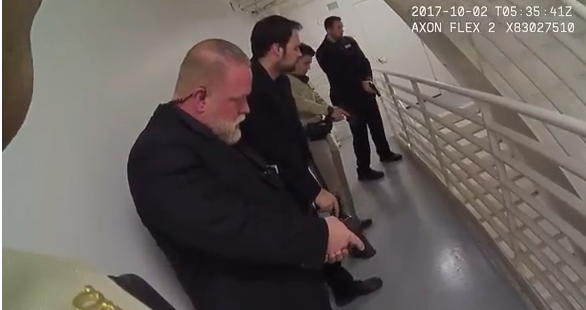 The THREE security supervisors then went into the stairwell after the gunfire stopped with Hendrex and Varsin and that was also recorded on police body-worn camera footage. Why is it that Sottile, Umstott, and Oelke are named as key witnesses in the police report and this third unknown armed manager is never mentioned, let alone identified? Security personnel along with LVMPD officers Hendrex and Varsin were in the security office of Mandalay Bay with two females being detained for trespass. They became aware via the radio of an active shooter call. Security Manager Oelke headed toward the Luxor side of the property when another call came over the radio that a Security Officer had been shot with a pellet gun in the tower of the Mandalay Bay. Security Manager Oelke ran to the Center Core guest elevators of the Mandalay Bay and met with security managers Sottile, Umstott, and LVMPD officers Hendrex and Varsin. As they arrived at the elevators, Engineering Supervisor Shannon Alsbury was holding the elevator and keep it from being stopped by guests trying to get on… As the door opened on the 31st floor, security managers Oelke and Umstott and LVMPD officers Hendrex and Varsin exited and walked up the 100 Wing upon hearing gunshots coming from an unknown direction. Security Manager Sottile and Engineering Supervisor Alsbury continued to the 32nd floor on the elevator. We saw the police body worn camera footage that showed Hendrex and Varsin getting off the elevator onto the 31st floor with THREE armed Mandalay Bay managers. Two are identified as Oelke and Umstott. Who is the third manager, why isn’t he mentioned and identified in the police report, and why isn’t he listed as a key witness as were Sottile, Oelke and Umstott. Anthony Sottile, Michael Oelke, and George Umstott’s interview summaries are noted in the final report, but again no mention of the third unknown manager. The final report states, “Sottile continued to 32nd floor and believed Officer Hendrex was with him at the time but doesn’t remember exactly who was there.” Sottile, the security operations manager for the Mandalay Bay Hotel couldn’t exactly remember who was with him during the worst mass shooting in modern American history. Let’s revisit the transcript of Sottile’s recorded statement to the FBI and the police when he talks about Hendrex. Ten times Sottile identifies Hendrex as a being with him on the 32nd floor, which we now know wasn’t true. So as soon as we heard that I yelled at Hendrex and said, “Elevators – elevators, shots fired on – elevators.” So, we ran, we grabbed an elevator. Me, my [names redacted], Officer Hendrex with Metro, his trainee, which I don’t know the name, it was her first day and myself we were in the elevator heading up to 32. Me and Hendrex got off on the 32nd When we got off on the 32nd floor we heard active shooting still going on. And Hendrex went up with me to 32. But when we got to 32 and we exited the – me and Hendrex exited the elevator, it was about a good two minutes, maybe a little more of active fire still coming from that room. It’s either gonna be me and Hendrex down the hallway or it’s gonna be the two [redacted] and the new Metro officer in the stairwell on the 100 wing. From the time that me and Hendrex were up there nobody had left the room. That door never opened. I reviewed Sottile, Oelke or Umstott’s transcripts of their recorded interviews with the FBI and the police and neither of them mention the third armed supervisor.